Create your own breakfast burrito using this delicious filling in your own tortillas! Hash browns, scrambled eggs, crumbled pork patty, peppers and onions for breakfast while backpacking? Yes please! It is easy to see why this is one of our most popular breakfast items to bring along on the trail. 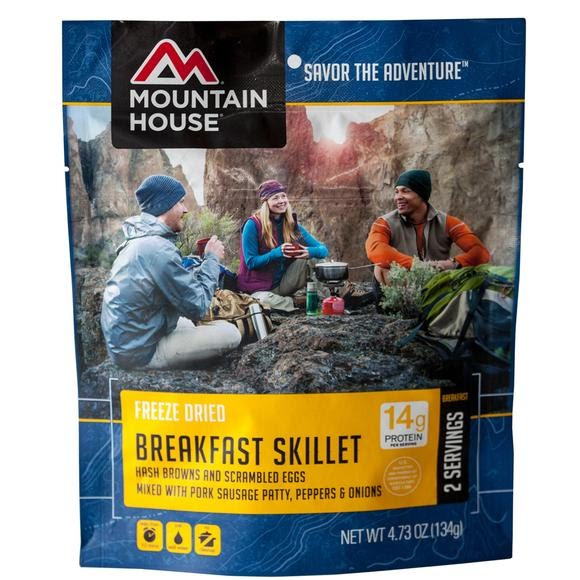 When it comes to backpacking food, Breakfast skillet is king! Mountain House Pouches - Pack light. Create your own breakfast burrito using this delicious filling in your own tortillas! Hash browns, scrambled eggs, crumbled pork patty, peppers and onions for breakfast while backpacking? Yes please! It is easy to see why this is one of our most popular breakfast items to bring along on the trail. When it comes to backpacking food, Breakfast skillet is king! INGREDIENTS: *Hash Browns (potatoes, vegetable oil [contains one or more of the following: canola oil, cottonseed oil, palm oil, soybean oil, sunflower oil], salt, dehydrated potato, enriched bleached flour [wheat flour, niacin, iron, thiamin mononitrate, riboflavis, folic acid], potassium sorbate [to mantain freshness], natural flavoring, disodium dihydrogen pyrophosphate [to promote color retention], dextrose)*Precooked Eggs (whole eggs, egg yolks, nonfat dry milk, modified corn starch, corn oil, salt, yeast extract, sunflower oil, smoke flavor, xanthan gum), *Pork Sausage ([pork, salt, spices, sugar], textured vegetable protein [soy flour, salt]), *Red and Green Bell Peppers, *Chopped Onions. *Freeze Dried Contains: Egg, Milk, Wheat, and Soy.